Here’s your July update from Flip the Fleet. You ran us over with over 512 responses, and well over 1000 comments to sift through! We preserve all your comments as a research archive by listing them at the end of the report of each 1-click survey report. You certainly say it straight, and this personal testimony really gives each survey and the ensuing media outreach an authenticity and depth. Thanks. About a third of you are following the correct and recommended protocol of checking tyre pressures at least once a month. Frankly, the rest of you could do your purse, energy conservation, emissions reduction, and any lingering range anxiety a favour if you checked your tyres more often and pumped them up to the recommended pressures. Tyres naturally go flat (they lose about 1 or 2 psi per month), so stay on the case! More regular checks would also keep you safer on the road. Under-inflation stretches your braking distance, especially in the wet. One study suggests a difference of 11 m during an emergency stop if the tyre is only at 25 psi rather than recommended 35 psi. How about you do yourselves, your family and your fellow citizens a favour by keeping your tyres at the pressure recommended by the manufacturer or mechanic. 69% of you are still running on the original tyres that came with your EV. A media release on your information is posted at https://flipthefleet.org/2018/media-release-ev-owners-need-to-pump-up/. We have bundled together some top tips for tyre maintenance and choice and posted them at http://flipthefleet.org/2018/top-tips-for-ev-tyres/. Your responses to our April survey signalled that many of you get good value from FtF’s Resources page, so we’ll start enriching that more from now on. Shakespeare’s Richard III lamented “a winter of discontent”. Had he owned an EV he might well have been referring to the way energy efficiency drops in the colder months. Your various EV models either report it as efficiency measured in km per kWh, or as energy consumption (kwh/100 km). Either way, your range drops and the cost of propelling your EV along the road increases. Daniel Myall has prepared some preliminary statistical models of seasonal changes in energy efficiency from all the data you have provided, also divided into four main regions. Each dot in the graph below represents a single car, so you can immediately see how enormously variable the energy efficiency is. Later we’ll have enough data to pinpoint what drives that variation, but it’s a fair bet that it relates to whether you drive in hilly terrain, how much of a load you carry, whether you are mainly driving in town or on the highway, what model of EV you drive, and how much of a lead boot you plant on the accelerator pedal! But there is also a pronounced increase in the seasonal effect as you come south in New Zealand. 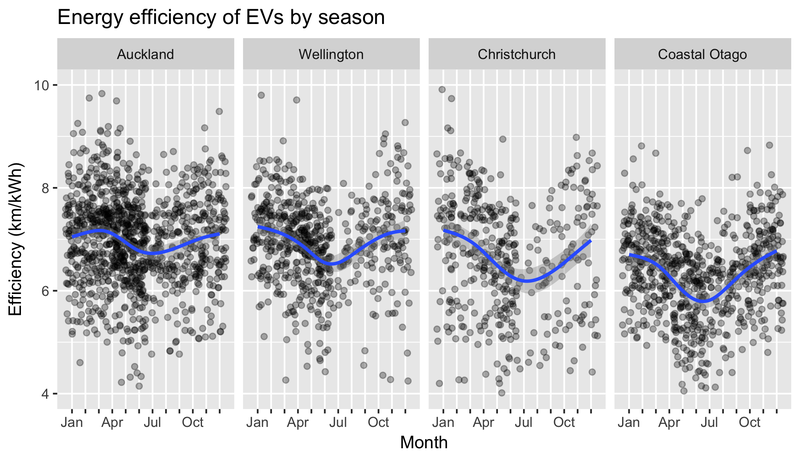 On average, EVs in Christchurch and Coastal Otago drop by around 1 km/kWh between summer and winter (about a 15% drop). In balmy Auckland this seasonal shift is only about 0.3 km/kWh, and in Wellington its close to 0.5 km/kWh. You might also notice a small decline in average efficiency as we go south – those Aucklanders get more out of their batteries and electricity than the rest of us. The winter drop probably partly relates to how much drivers use accessories like heaters, lights and wipers, but there is also some underlying physics at work here – colder batteries don’t work as efficiently as warmer ones. Figure 1: Energy efficiency (km/kWh) of electric vehicles in different regions of New Zealand. This analysis shows the potential and growing power of Flip the Fleet and your collective contributions. It helps EV owners be better prepared for winter, to plan their longer trips more carefully, and might even prompt them to check their tyre pressures to squeeze that bit more out of their EV in winter (sorry, we couldn’t resist thumping that one in again!). It helps dealers advise prospective purchasers more reliably – to match their travel needs against winter range rather than just the summer capabilities of the EV. That in turn helps EV uptake by avoiding disappointment of the new owners when the colder months come round – EV owners are the best advocates and persuaders of others to switch over. The efficiency information can help energy suppliers better anticipate coming demand for electricity in different seasons and different regions, which in turn helps policy makers, regulators and marketers. For example, what size of home solar generation of electricity can best meet a family’s EV needs in the south of New Zealand compared to in Northland? We don’t have more than a glimmer of how your data are going to be applied, but it sure will be useful for lots of layers and players in the sustainable transport and energy field. Good news! Walter Larason’s tests of the reliability of Nissan’s fix of the Battery Management System firmware suggest that the patch greatly improves the car’s estimate of remaining energy in the battery and its State of Health. 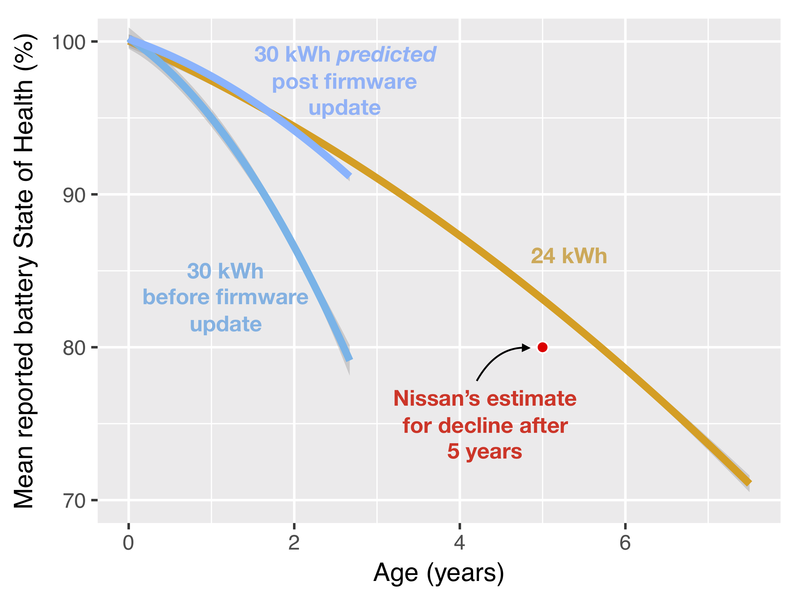 You can read the full report and download a pdf of it at https://flipthefleet.org/2018/30-kwh-nissan-leaf-firmware-update-to-correct-capacity-reporting/. When we apply the correction factor retrospectively to all the data you have generously contributed, the trajectory of the new estimates of battery State of Health of 30 kWh Leafs is very similar to that observed in 24 kWh Leafs in the first two and a half years of their life. Figure 2. Average measures of battery ‘State of Health’ as 24 kWh and 30 kWh Nissan leafs get older. The lower line for 30 kWh Leafs is that observed for your vehicles before any firmware update. The upper line is the predicted trajectory once the recent firmware update has been applied. The red dot shows what Nissan expected for a Leaf after 5 years. This suggests that part, perhaps even most, of our original concerns that the early 30 kWh Leaf batteries are degrading much faster than expected was a false alarm stemming from instrumentation error rather than deterioration of the battery itself. That’s a great relief because firmware is easier to fix than the battery itself! However, we are also very disappointed that Nissan New Zealand have so far not agreed to supply the firmware fix through their dealer network. This raises a much bigger question of support of second-hand imports of EVs in New Zealand by manufacturers and dealers in future, should a similar or even worse problem become apparent in the EVs, or any other types of vehicles for that matter. The number of EVs signed-up to Flip the Fleet passed 1000 this month. That’s equivalent to around 11% of all the EVs registered in New Zealand so far. We reckon you have collectively contributed over 47,000 data points already. You can tell by this month’s feature of energy efficiency that the database is gathering sufficient strength to answer some of the more detailed questions like regional differences. We still need a lot more information on models other than Nissan Leafs, but more numbers from them will still allow us to go deeper. You can rearrange the way the reports appear on your Dashboard by clicking on Settings icon (bottom of the left-hand bar when you log on), and then selecting ‘Dashboard Settings’ (middle of top row). You can shift reports around or hide them, or create new pages with different combinations of reports. Your customisations will be saved for all future visits to the dashboard. Go for it. Have been interested in your Tyree survey. I not only keep an eye on my tire pressure but intend to orate my tyres as well and have them balanced to get the most out of them.